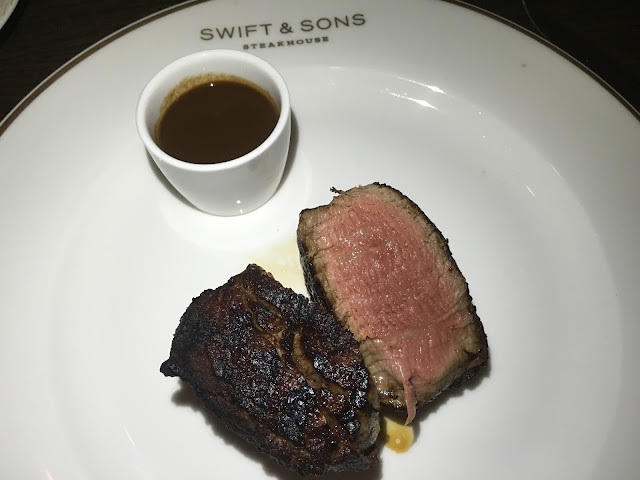 While there are a ton of new restaurants popping up in Chicago, there was one in particular I was very excited to try, Swift & Sons, a new West Loop steakhouse that "evolves the American steakhouse for the modern diner." The restaurant, a collaboration between Boka Restaurant Group and B. Hospitality, is named after Gustavus Franklin Swift, a pioneer of the Chicago cattle trade. The restaurant is located in the brand new Google building on Fulton Market. The space is huge and even has its own concierge and a separate seafood restaurant off its main lobby (Cold Storage, opening soon). I stopped by with the BF for a weeknight dinner to check out the menu. The space was designed by the same company that designed Boka Group's Momotaro, Avroko, and is filled with intricate details, curves, and textures. Executive Chef Chris Pandel's (The Bristol, Balena) menu is pretty standard for a steakhouse and is divided into appetizers, shellfish, soups & salads, entrees, steaks, and sides. It's no surprise the wine list is very extensive. But don't fret, the somm is happy to help guide you toward the perfect wine selection. The BF and I decided to split one starter and each order our own steaks. At the recommendation of our server (who was incredibly knowledgeable about every detail of the menu), we tried the salmon tartare with cucumber, creme fraiche, and charred onion. The base of the dish was a chilled cucumber puree that was extremely refreshing. The salmon tartare sat on top and featured a thick layer of creme fraiche. On the side was a long fennel flatbread which we used as a vessel for scooping up the fresh salmon. It was a light and refreshing way to start the meal. When it comes to the steak portion of the menu, you have quite a few options from filet mignon and wagyu, to ribeye, porterhouse, and even a beef wellington for two (which I will definitely order next time). You can also tack on extras like sauces or seafood to make your own surf and turf. We both decided to order the filet mignon; I went with the 6 ounce, and the BF chose the 8 ounce. We added a side of anchovy-garlic butter per our server's recommendation, but didn't end up using it on our steaks. It's just butter. We both thought the steaks had incredible flavor, and the perfect crispy char on the outside. I mean, just look at it on the plate! We ordered ours medium rare and they had so much flavor and were well-seasoned that we felt there was no need for an added sauce. However, all steaks come with a side of housemade steak sauce. All steaks are served a la carte, so we ordered two sides for sharing, the tartiflette potato, and the crispy fried Brussels sprouts. The potato was similar to an au gratin potato, with a luscious layer of creamy baked cheese on top. The potatoes were studded with chunks of country ham and caramelized onion. The Brussels were definitely my favorite. They were sauteed in a super flavorful Asian sauce and had the perfect crispy texture. Last but not least, was one of my favorite parts of the meal, dessert. Swift & Sons does not play around when it comes to dessert. They have one of the best pastry chefs in the country, Meg Galus (Boka, Momotaro, NoMI Kitchen), who produces a wonderful dessert list. It was extremely difficult to pick one dessert, so we tried two! The black bottom pudding is what dreams are made of. It features a base of black cocoa crumble, topped with baked dark chocolate mousse, milk chocolate pudding, and a scoop of white chocolate sorbet. Yea. It's incredible. And lasted a mere 30 seconds before the BF and I demolished it. The second dessert was actually a platter of small chocolate bites. Meg's chocolate platter features 7 rotating chocolate bites, priced per person. We ordered a platter for one and it was plenty! The daily platter included caramels, cookies, chocolate mousse, and a pumpkin pop adorned with the Swift & Sons logo. We ended up bringing these home for later (they paired nicely with a rich cup of coffee!). Overall, I was impressed with the quality of the service and food, especially given the restaurant has not been open for long. Our server was attentive and informative and the entire staff was welcoming and super friendly. I thought my steak was one of the best I've had, and having such a huge sweet tooth, I was happy to see how serious they take take dessert. I'm giving Swift & Sons 4.5 ghosts out of 5!